A new scheme to make good use of slightly blemished supermarket food will benefit more than 200 employees of the Aboriginal Tangentyere Council but not – it seems – the unemployed or destitute in Alice Springs. The Coles Community Food SecondBite program, a national initiative, will “provide a healthy and nutritious breakfast meal for more than 200 employees every day,” according to a media release, aiming to deliver more than 15,000 meals in the first year of the project. SecondBite CEO Elaine Montegriffo, asked why the food was not provided to people who don’t have a job, said: “There is no question there are other people in need but this is where we’re starting. Most town camps are within a five kilometer radius of the Tangentyere premises in the town’s industrial area. Coles is a major supplier of liquor in Alice Springs, and there have been concerns with other local food programs that they may free up cash for the purchase of grog. Mr Folks says products supplied are fruit and veg with “a little bit of bruising which you can easily cut off,” bread “left over from today’s bake,” tins with a small dint or a torn packets with the inside still intact. These are goods “rescued” from being taken to the landfill, says Ms Montegriffo. The media release says through the national program, managed by SecondBite, Coles has already donated more than a million kilograms of food to more than 300 community food programs, the equivalent of two million meals. Tangentyere’s Liam O’Sullivan did not respond to our request for comment. 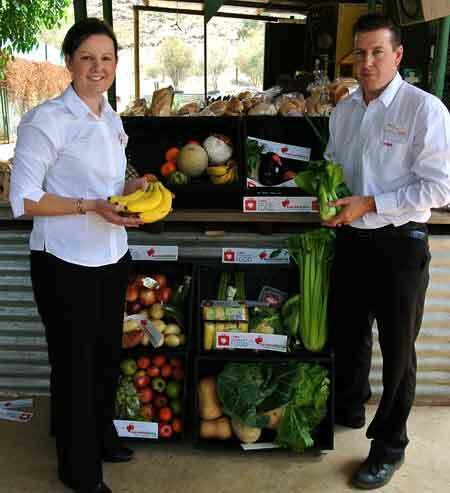 PICTURED are Coles Alice Springs manager Sarah Vivian and deputy manager, Glenn Harvey, with the kind of food provided for the program. Elaine, where are you? Obviously not in Central Australia if you consider that “within five kilometers” is a “long way”. I’m sure that the Salvation Army or St Vinnies could do a great job of distributing the food to those who really need it, not the paid workers who can well afford to support themselves, as does every other employed person. I agree with the above writter, why not reduce the price of damaged goods, and give the regular supporters of Coles a go. So far three quite different comments on this article. Here is a fourth. If Coles is supplying 300 community food programs with “more than a million kilograms of food”, according to its press release, shouldn’t it be looking at more efficient ways of dealing with perishables? Food wastage from the big supermarkets is monumental … and we all pay for that. Might get myself a “job” at Tangentyere and spend some time in the supermarket damaging stock that I’d like to eat for breakfast. Seriously, this has got under my skin. Have Coles had the wool pulled over their eyes? Poor people living in town camps a long way away? Why don’t Tang do something like feed the elderly or infirm etc. Then again, perhaps the extra energy the employees will receive might make the organisation a little more useful. One wonders why “employees” of any organisation earning a salary would need free food. Who will prepare it in the Tangentyere kitchen … people who are being paid to do other work, or someone hired especially? Are these people being paid by Federal or NT Government grants? While I’m all for preventing food being wasted under any circumstances where it can be used safely elsewhere, this move seems to target the wrong group of people. Anyone with a job shouldn’t need free food. Are Coles aware that customers are always looking out for a bargain? Having slightly bruised or damaged products at very cheap prices would benefit most customers. We are all screaming out at the raised food prices, so why not sell the stuff to the general public at “very” reduced prices. Sure, giving it to Tangentyere is a great idea too, but let the people of the town have a choice in buying these so called “seconds” products too.